EPA's climate change website under the Obama administration now directs visitors to a page that's being "updated" by the Trump team. This story was updated at 8:45 a.m. EDT. Some U.S. EPA webpages about climate change are trickling back onto the agency's website, but without references to rising temperatures. 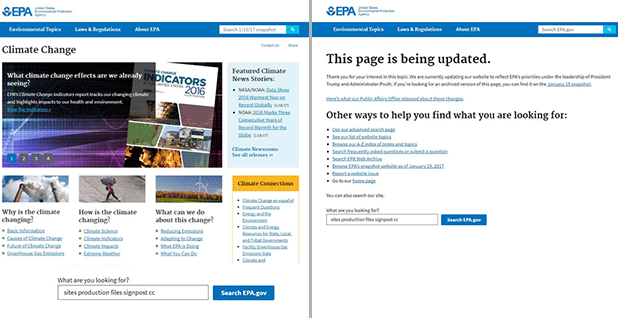 Other webpages are still missing, having been replaced with messages indicating that they're being reworked to "reflect EPA's priorities under the leadership of President Trump and Administrator [Scott] Pruitt." On the pages that have been returned, certain links to data, newsletters and webinars related to climate have been removed, according to a new report from the Environmental Data and Governance Initiative, which has been tracking webpage changes across government agencies. Some links have also been removed that once offered details about climate mitigation strategies being employed in states across the country, EDGI found. These are some of the first webpages to be returned after disappearing under the Trump administration, said Toly Rinberg, a EDGI Website Monitoring Committee member. They could signal how future websites might be edited, he said. "This is the first instance of returned content since the April 28th removal, and the agency returned that content without notice or explanation of why certain portions were not included on the new website, which can be confusing for the public and can reduce access to those resources for a long period of time," he said. Some of EPA's pages have been altered to avoid in-depth explanations of human-caused climate change, EDGI found. For instance, before the edits, the word "climate" appeared 15 times on a webpage entitled "Climate and Energy Resources for State, Local and Tribal Governments." Now it doesn't appear at all. And multiple links to climate information are gone. For example, the website's main page no longer links to "State Climate Action Framework," "Local Climate Action Framework," "Climate Showcase Communities Program" or "Tribes & Climate Change Action," according to EDGI. "The previous administration's webpages are still available by clicking the large link plainly visible on the banner at the top of EPA.gov," an EPA spokesperson said. The website quietly reappeared in July. EPA made no announcement of its return, unlike in April when the agency issued a press release about it being taken down. Webinars related to climate on EPA pages are gone, while others on different topics remain. Newsletters related to energy remain, but those for climate are missing, EDGI found. Energy resources, including information related to renewable energy, was returned to the altered webpages. Overall, a wealth of climate information has been deleted. A webpage entitled "State Climate and Energy Program" is not linked to. That page had information on how to reduce the effects of heat islands and intense heat waves. It listed a series of state action plans, including Alaska, California and Virginia, that have reduction strategies. Those have not been returned. EDGI is tracking 25,000 websites across the federal government. It has tracked a pattern of alterations to webpages that reference climate change across agencies, including the Interior, Agriculture and Energy departments. Recently, EDGI found changes at the National Institute of Environmental Health Sciences. Sections related to climate change and human health disappeared from its homepage, and links to climate-related reports are no longer present. EDGI also discovered broken web links on the website for USDA, and an EPA link to the science supporting the endangerment finding was inoperative. Spokespeople at various agencies have said the removal and alteration of climate data is due to technical problems or routine maintenance. All incoming administrations alter and update federal websites. But the changes have raised observers' eyebrows due to Trump's skepticism about climate science. Pruitt has also questioned the accuracy of climate research at his own agency. Though the vast majority of climate scientists determined long ago that humans are the primary driver of climate change, chiefly through fossil fuel consumption, Pruitt has called for a debate to question that assertion. He has also sought to increase the voice of industry scientists in crafting environmental policy. Earlier this week, Pruitt suggested in a speech at the Heritage Foundation that scientists on EPA advisory boards who receive government grants may have conflicts of interest. Many, if not most, of the scientists on the advisory boards receive that type of funding, which go largely toward college and university research programs. Industry scientists, or climate researchers who reject the mainstream consensus on climate change, are less likely to receive government grants. "If we have individuals on those boards receiving money from the agency, sometimes going back years and years to the tune of literally tens of millions of dollars over time, that to me causes questions on the independence and the veracity and the transparency of those recommendations that are coming our way," Pruitt said.